The addition of Mahler to the UE catalogue was announced in a press statement issued early in March 1906: see Neues Wiener Tagblatt, 40/68 (10 March 1906), 12. See Neuigkeits-Welt-Blatt 35/42 (20 February 1908), 9, where Hertzka was described as ‘einer auf dem Gebiet des Verlags bekannter Fachmann’. Fadüm had been appointed as Weinberger’s successor in 1906. For further accounts of Mahler's dealings with UE and Hertzka see PBMNC and FWGMV. Willnauer corrects the dating of this letter. It should be remembered that Mahler's contract with EWZG had just such a clause, and had been a cause for concern at the time of the negotiations for the publication of the Fifth Symphony. Sie repräsentiert mit großer Wahrscheinlichkeit die erste reine Verlags-Aktien-Gesellschaft (d. h. im Gegensatz zu bestehenden „Vertikalkonzernen" mit Papierfabrik, Druckerei, Verlagshandlung, Vertrieb und Sortiment) in Österreich. Mehr noch: Sie ist ein Beispiel dafür, wie man einen etablierten Verlagshäusern in Deutschland ebenbürtigen Verlag in Österreich schaffen konnte, und wichtiger: das Verlegen „moderner" Musik, vor allem moderner österreichischer Musik, gewissermaßen repatriieren konnte. Die Entwicklung dieser Musik hatte sich bis dahin im wesentlichen außerhalb Österreichs vollzogen. Die musikalischen Verlagshandlungen in Berlin, Leipzig, Mainz und an anderen Orten hatten Österreich den Rang abgelaufen. Selbst die neuen und alten Wiener Klassiker bis zu den Brüdern Strauß fanden in Österreich fast ausschließlich in Leipziger Editionen Verbreitung. Werke von Brahms und Hugo Wolf, um nur zwei Beispiele zu nennen, mußte man in Österreich aus dem Auslande beziehen. Lediglich die „Wiener Operetten" waren lange Zeit hindurch der einzige nennenswerte Exportartikel Österreichs. It almost certainly represents the first purely publishing company (i.e. in contrast to existing ‘vertical’ businesses with paper making, printing, publishing, distribution and retail) in Austria. More than that, it is an example of how one could create in Austria a publishing company equal to the established publishing houses in Germany, and, even more importantly, repatriate to some extent the publication of modern music, above all modern Austrian music. Previously the deployment of this music had been accomplished mostly outside Austria. The music publishing businesses in Berlin, Leipzig, Mainz and in other locations had outdone Austria. Even the modern and old Viennese classics, including the Strauss brothers, found distribution in Austria almost exclusively through Leipzig editions. Works by Brahms and Hugo Wolf, to name but two examples, had to be imported into Austria from abroad. For a long time the Viennese operetta was the sole notable Austrian export item. As Hall’s study documents, music publishing merely reflected the malaise of publishing generally in the Dual Monarchy: most of the important nineteenth century German-speaking literary figures in the Habsburg lands were also published primarily in Germany, not Austro-Hungary. The factors that shaped this situation were, broadly speaking, three-fold: censorship (which had much less impact on music publishing), the unhelpful development of copyright in the Monarchy (with, for example, very limited protection for authors against unauthorised translation), and the failure of Austro-Hungary to sign the Berne Convention in 1886. The basic law in force during most of the second half of the nineteenth century was codified in the Imperial Patent of 19 October 1846, and it was only with a new law of 26 December 1895 that copyright protection was extended to more recent artistic media, such as photography. Some existing forms of protection were improved, but in most respects the Austrian legislation was lagging behind developments in copyright elsewhere in the world. There was one major exception: the establishment of performing rights for non-theatrical musical works, opening up opportunities for exploitation that were recognised early by the music publisher Josef Weinberger. Auf der ganzen übrigen Erde ist der österreichische und ungarische Autor vogelfrei; jeder kann ungestraft seine Schriften nachdrucken oder übersetzen, seine Compositionen vervielfältigen und aufführen lassen, seine Kunstwerke nachbilden, ohne ihn für seine geistige Arbeit auch nur in geringsten zu entschädigen. In the whole of the rest of the world the Austrian or Hungarian author is outlawed: anyone can with impunity reprint or translate his writings, copy or perform his compositions or reproduce his works of art without compensating him in the least for his intellectual work. ... mehrere hervorragende österreichische Buch- und insbesondere wegen der stets wachsenden Bedeutung der Wiener Operette auch Musikalienhändler ihre Verlagstätigkeit nach Deutschland verlegen müßten, um ihren Werken und deren Autoren den vollen Schutz der Berner Union zu sichern. Ein derartiger Exodus würde aber von sehr schlechten Folgen für die österreichische Buch-, Druck- und Verlagsindustrie begleitet sein. ... more prominent book and also – in particular because of the steadily growing importance of the Viennese operetta – music dealers might transfer their publishing activity to Germany, in order to secure the full protection of the Berne Convention for their works and their authors. However, such an exodus would be accompanied by very unfortunate consequences for the Austrian book, printing and publishing industries. Die Initiative, in Wien einen neuen Musikverlag zu gründen, war von dem Bankier Josef Simon ausgegangen, dem Schwager von Johann Strauß. Simon gehörte dann nach der ersten konstituierenden Generalversammlung (15. Juni 1901) neben den Verlegern Bernhard Herzmansky, Adolf Robitschek und Josef Weinberger dem Verwaltungsrat der Universal Edition an. The initiative to found a new music publisher in Vienna emanated from the banker Josef Simon, Johann Strauss’s brother-in-law. Following the first constitutional general meeting (15 June 1901), Simon was a member of the executive committee, along with the publishers Bernhard Herzmansky, Adolf Robitschek and Josef Weinberger. 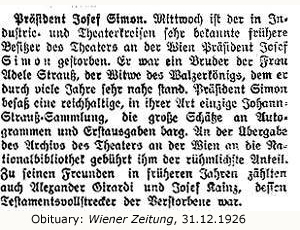 Josef Simon (23 February 1854–29 December 1926) was born in Horschitz (Horsice) in Bohemia, but spent much of his life in Vienna where he was a director of the Österreichische Länderbank, and other major businesses. He had married Luise Deutsch, the sister of Strauss’s wife, and became involved in artistic life, forming an outstanding collection of manuscripts, printed editions and memorabilia focused of the music of his brother-in-law and the Viennese tradition he represented (this collection is now in A-Wst), and in 1900 joining a consortium that purchased the Theater an der Wien. It is very likely that Simon knew Weinberger a few years before the UE project came to fruition, since Weinberger had acquired Strauss copyrights in 1897–9 and therefore almost certainly would have had business dealings with the Strauss heirs. In the middle of the evening the door opened and in came a little old man. He seemed to know everybody, and no sooner had he seen a stranger in that crowd of friends than he asked my uncle who I was. My uncle motioned me to come over and be introduced. Only much later would I find out that this was the decisive moment of my life. The old man’s name was Joseph Simon. "Young man," he said, "I am the brother-in-law of Johann Strauss. Would you like to come to my house and see my collection, my Johann Strauss collection?" The next day I went to see Joseph Simon and his Johann Strauss collection in his old house at the Schottentor in Vienna. My uncle .... told me that this collection was the old man’s pride, his life, his everything! Half a century ago Simon had been accidentally touched by the wing of immortality when his wife’s sister married the waltz king, and he had never recovered from the shock. From now on he wasn’t just Joseph Simon, a rich man whose only profession it had been to cut coupons from stocks and bonds; from now on he was forever Pepi, the brother-in-law. He at once became a great connoisseur of music and an ardent collector of everything ever used, touched, looked at, or thrown away by the great Johann. His apartment was bulging with Johann Strauss relics pictures, programs, first prints, ladies’ fans with fading inscriptions, an old bow tie, a single glove, and an unending array of similar nineteenth-century firlefanz. ...."Young man," he said, "you seem to have an ardent and serious interest in music. How would you like to work in a big music-publishing house? I am the chairman of the board of Universal Edition. If you want I take you there tomorrow. I will ask Emil Hertzka to give you a job." This struck me like thunder. Universal Edition at that time was the most powerful and the most progressive publishing house in Europe. Emil Hertzka, the manager, was not just a man. He was an idea. To be invited to meet him without even having asked for it was like having Rockefeller ring your doorbell one morning and beg you to have breakfast with him. ... Pepi, it appeared, was not only a harmless brother-in-law, he was the majority stockholder of three corporations (one of them Universal Edition) and chairman of the board of all three.... Every morning he would set out at an early hour in his old-fashioned automobile to descend on the unfortunate men in charge of the three companies. He would settle down for a chat on the day’s events, offering advice and criticism, to the disgust – nay, terror – of his helpless victims. The one redeeming feature was that he would devote precisely one hour to each of the three companies, but this was cancelled out by the fact that he was always switching schedules so that none of them ever knew when his activities would be interrupted and stalemated for sixty minutes by a cheerful "Good morning! What’s new today?" Wenn der österreichische Musikalienverlag heute alle musikalischen Bedürfnisse zu befriedigen vermag, ja wenn er sogar imstande ist, mit dem reichsdeutschen Musikalienhandel im Deutschen Reiche selbst in sehr fühlbaren Wettbewerb zu treten und wenn außer den österreichischen Operettenkomponisten auch die ernsten Tondichter unserer Heimat die Hoffnung hegen dürfen, ihre Werke in der Heimat veröffentlichen zu können und mit meimischen Gelde kaufmännisch verwertet zu sehen, wenn also der wohlbegründete österreichische Pessimismus in solchen Dingen doch wenigstens auf dem urösterreichischen Gebiete der Musik durch eine ruhmvolle Tat widerlegt worden ist, so verdanken wir dies einigen ebenso geschäftstüchtigen als patriotisch gesinnten Männern, Wiener Musikverlegern, die im Vereine mit der in ihrer Leistungsfähigkeit gegenwärtig unübertroffenen Wiener Notendruckerei R. v. Waldheim, Josef Eberle & Co. im Jahre 1901 das großzügige und – wie sich bald zeigte – überaus erfoldgreiche Unternehemen der Universal-Edition (A.G.) ins leben riefen. If the Austrian music publisher today has the capacity to satisfy all musical needs, if he is even in the position to enter into very perceptible competition with the national music trade in Germany itself, if alongside the Austrian operetta composers the the serious composers from our country may also cherish the hope of being able to publish their works in this country and seeing local finance turning them to good commercially use, if therefore the well-established Austrian pessimism in such matters might be refuted - at least in the fundamentally Austrian field of music – by a famous deed, then for this we must thank some enterprising and patriotically inspired men, Viennese music publishers, who, in association with R. v. Waldheim-Josef Eberle & Co. – currently, in terms of its capacity, the unsurpassed Viennese music printer – called into being the grandiose and – as it soon proved – extremely successful venture, the Universal Edition (A.G.). If Simon negotiated some of the capital investment, and Jos. Eberle & Co. provided the music printing expertise and capacity, it seems it was Weinberger who contributed the skills of a successful music publisher with an international perspective, and effectively ran the new business as its CEO in the early years: UE was initially operated from the Weinberger offices at Maximilianstraße 11, before moving to Wipplingerstraße 32 in 1908 (perhaps significantly, the year Emil Hertzka took over management responsibility), to Reichsratstraß 9 in 1911 and finally to the Musikvereinsgebäude in Karlsplatz in 1914 (the latter move causing some disruption: see BSC, 48). Aus diesem Prospecte ist aber nicht ersichtlich, warum er von Seite des amtliche Preßbureaus verbreitet und ob das Unternehmen etwa von der Regierung unterstützt wird. Es heißt darin nur, daß die neue Musikausgabe unter Zusammenwirken der hervorragendsten Interessenien des österreichisch-ungarischen Musikverlages gegründet wurde, und daß ein solches Unternehmen in Oesterreich noch nicht bestanden hat. It is not obvious from this prospectus why it was released by the official press office, or whether the undertaking is perhaps underwritten by the Government. It is reported only that the new music edition was founded though the collaboration of the leading interests in Austro-Hungarian music publishing, and that such an undertaking not previously existed in Austria. Although the true extent of Government involvement is still unclear, the fact that a ministerial press office was involved suggests a degree of more than covert support. On the other hand the report ends by pointing out that the release never identifies the publisher who will be issuing the publications. According to UE's own first history the first volumes had appeared in January 1901 and by the end of the year about 400 publications had been issued (UE25, 9). Among the documentary records that date back to those first years of the Edition, the most important are probably the Verlags- or Verlagsnummerbücher. These ledgers list in strict edition number order every publication of the Edition assigned such a number. They are an essential, but – it needs to be remembered – circumscribed source of information about the early history of the company. They offer an account (literally) of the publishing activity, but record little if anything of the legal and commercial framework in which that took place, or the editorial processes that underpinned the production of the Edition’s publications. Even the meaning of individual entries needs to be construed with care. Nevertheless, taken as a whole, they offer an exceptional insight into the dissemination of ‘modern’ music in the early twentieth century. Unfortunately the hopes that this single source will provide all the crucial information about who the in–house editor was, the date the copy was sent for engraving and the dates of dispatch and receipt of first and second proofs, are rarely fulfilled in general, and never for the Mahler publications. The UE Archive does have a few in–house production cards relating to Mahler publications, but all date from much later periods (as do the hire library cards relating to Mahler, the earliest of which dates from 1928). Sadly it is very unlikely that any of the internal printing records of Universal Edition’s printer, Josef Eberle & Co. / Waldheim-Eberle survive: the successor company ceased to exist in the early 1990s and only a small part of its business archive has been traced. But at least the Mahler entries in the Verlagsbuch do (almost always) record the details of the date of the print order, and the number requested, and invariable give the date of receipt, and quantity delivered. Occasionally additional information is included in the unused columns. For the late works assigned to Universal Edition from the outset – Symphonies 8 and 9 and Das Lied von der Erde – the interpretation of these records is relatively unproblematic. For works absorbed into the UE catalogue by more circuitous roots, the Verlagsbuch entries can be rather more ambiguous, even misleading. The first works by Mahler to appear in the UE catalogue were issued in 1906,¹ and were all titles for which the rights were held by Druckerei- und Verlags-Actiengesellschaft, vorm. R. v. Waldheim, Jos. Eberle & Co (the successor to the Erste Wiener Zeitungs-Gesellschaft), and which were published on commission by Josef Weinberger (Symphonies Nos 1–3) and Bernard Herzmansky (Ludwig Döblinger) (Symphony No. 4). All three were among the founding shareholders in Universal Edition, and the publications concerned – study scores and piano duet arrangements, were ‘In die Universal Edition aufgenommen’. Only the first impressions of a particular publication is listed. Italics are used to identify entries made (unusually) in pencil (see below). see the bibliographic descriptions in the main entries for the works concerned. Exactly what the commercial arrangement lying behind that phrase might have been is not entirely clear: Waldheim-Eberle held the publication rights yet the title pages of the UE issues – though adopting the distinctive UE house design – are unequivocal in retaining the imprints of the two distributors, ostensibly as publishers; the publications all (except for the study score of the First Symphony - see the catalogue entry for a discussion of this exception) retain their original plate numbers, or those of the corresponding full score. The tri-partite contractual agreement, and the decision to adopt the new format were presumably finalised in the autumn of 1905, because in December of that year UE announced its new role in marketing the first four Mahler symphonies. Gestatten Sie mir Ihnen I Exemplar der nunmehr fertig gewordenen kleinen Ausgabe Ihrer 4. Symphonie Partitur zu überreichen. In den nächsten Tagen werden auch die anderen Partituren fertig und ich werde mir erlauben, Ihnen dieselben nachzusenden. Ich hoffe, dass die Ausführung dieser kleinen Partitur Ihren vollen Beifall finden wird, und wie Sie aus der Adjustierung ersehen, ist es uns nunmehr gelungen, Ihre gesamten in unserem Verlage erschienen Symphonien* der Edition einzuverleiben, was gewiss einen bedeutenden Aufschwung im Umsatz dieser Werke zur Folge haben wird. Allow me to present you with a copy of the just completed reduced-format edition of the score of your 4th Symphony. In the next few days the other scores will be finished and I will duly send these to you. I hope that the layout of this small score will meet with your full approval, and as you will see from the adjustment [in size], we can henceforward successfully incorporate all of your symphonies published by our firm into the [Universal-] Edition, which will certainly result in a significant upswing in the turnover from these works. Die Ausführung ist wirklich schön gelungen, und ich bin sehr begierig, recht bald die Ausgabe der anderen Symphonien zu erhalten. The layout is really beautifully successful, and I am very eager to receive the copies of the other symphonies quite soon. The emphasis Stritzko placed on generating increased turnover is significant, and may in part have been a response to pressure from Mahler, who in the 1890s sought to persuade Schott to set the price of the Lieder und Gesänge volumes as low as possible (GMBsV: 82): the strategy adopted in the re-issue of the symphonies was to exploit UE's existing targeting of the pedagogic and domestic markets, while leaving responsibility for handling the professional market (full scores and part sets) to the original distributers. This was to be achieved through UE's distribution network and marketing, the adoption of a smaller, cheaper format for the scores, and a lowering of the price of the piano duet arrangements (see Table 2). The currency most commonly used in advertisements for all these issues was the German Mark and is adopted here. Regrettably there is no clue as to when the discussions of the new initiative had commenced. Stritzko implies that, understandably, there had been some concerns about how well such complex scores could be reduced to an octavo study score format (c. 245 x 175) which was midway in size between the folio full scores previously issued, and 16mo miniature scores (a format not widely used in Vienna before the establishment of the Wiener Philharmonischer Verlag in 1923). In fact the clarity of the original engraving by EWZG was such that the photolithographic reduction in size was remarkably successful. Stritzko was apparently sending Mahler a finished copy of the new study score (i.e. not proofs) of the Fourth Symphony. Taken at face value his next statement suggests that work on the new format scores of the other three symphonies was underway and was expected to be completed shortly. If that was the case, Mahler must have already either (a) prepared revised and corrected copies of the full scores of all four symphonies or (b) made corrections on new sets of proofs. Unfortunately no such scores or proofs have been located. In the case of the Third Symphony the revisions involved were quite extensive and required newly engraved plates. There is no entry in the UE Verlagsbuch corresponding to the first printing of the Fourth Symphony study score, a copy of which Stritzko sent to Mahler in January 1906, so in this case – and perhaps in the case of some or all of the other early UE issues – the records in the ledger are incomplete. This may reflect initial uncertainty on the part of the UE staff about how to record the ordering and transfer processes, perhaps because the initial order for this new format score was initiated by EWZG, not UE. Whatever the explanation, this anomaly also draws attention to the fact the entries in the relevant Verlagsbucher for the first batch of Mahler issues have other notable and unusual features. The eight publications were assigned a block of consecutive edition numbers by UE independently of the ordering and publication sequence (this must have been sometime before mid-December 1905: see Fig. 2). All the initial order and delivery entries for the piano duet copies are in pencil (as indicated by the use of italics in Table 1): elsewhere ink is invariably used for such entries. Moreover, order dates are only one day earlier than the relevant date of receipt. Waldheim-Eberle could certainly turn around work quickly when necessary, but not usually that promptly. The reason is probably bound up with the fact a reprint was not necessary because EWZG held unsold stock of the arrangements as issued under the Weinberger or Doblinger imprints: copies of all four such issues with a Universal-Edition label pasted over the original imprint survive. The fact that all four orders date from several months after the listings in Hofmeister is a further indication that the records in the UE ledger are incomplete, and that batches of the arrangement with the necessary paste-overs had been supplied earlier. The dates of ordering and receipt for the printings of the study scores of the Second and Third Symphonies are consistent with normal patterns recorded elsewhere in the Verlagsbuch but not that for the First Symphony. Table 1 indicates that the UE management believed there was a substantially enhanced market for the study score of the Third Symphony, a view founded on the astonishing interest shown in the work following its sensationally successful première at Krefeld on 9 June 1902: between then and April 1906 it had already received a further nineteen performances. 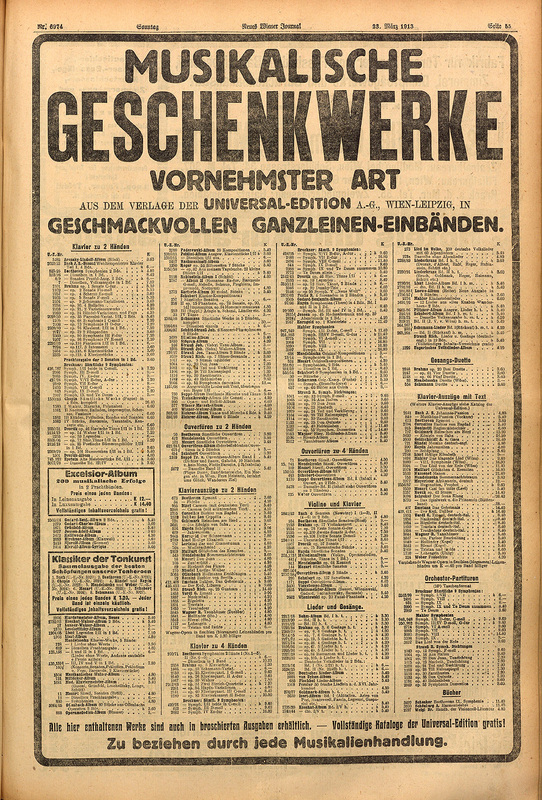 This assessment of the market proved to be correct: as the Verlagsbuch reveals, between February 1907 and April 1913 an additional 794 copies were ordered. None of the UE Verlagsbuch entries for works in the first batch of Mahler's works licensed to the firm in 1906 make any reference to the rights owner (EWZG) or to the distributors (Weinberger or Doblinger). The entries for all four works in the second batch originally referred to Josef Weinberger Verlag: this probably reflected an erroneous belief that Weinberger owned the rights to all four. Subsequently these references in the entries for the last three works were struck through, presumably to correct the misunderstanding. 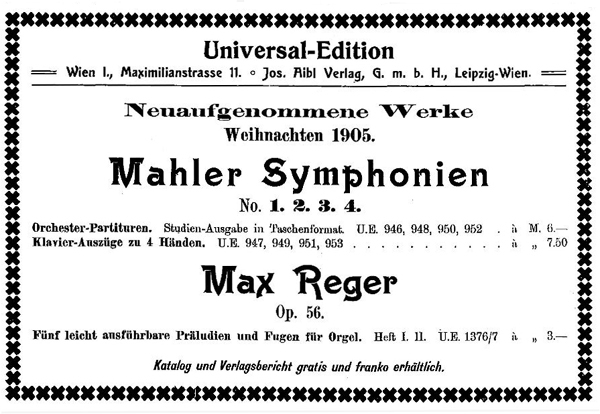 Nevertheless it is hard to see why the ownership of the copyrights should have impacted on the ordering of copies: in 1906 EWZG had already entered into a licensing agreement with UE for some of the Mahler publications they had prepared. The one work in the 1908 batch owned by Weinberger – the Lieder eines fahrenden Gesellen – was issued in 1908, but after six impressions of the UE issue had been printed (a total of 1302 copies), it was withdrawn from the UE catalogue, as a pencil annotation to the Verlagsbuch makes clear: ‘Aus dem Katalog gestrichen 1916’. On 14 October 1915 an order for 200 copies of the song-cycle had been recorded, but subsequently crossed through: for whatever reason Weinberger had decided to cancel the agreement with UE. The entry also records ‘Sämtliche Druckkosten zahlen wir’ suggesting that a different financial arrangement – a division of printing costs between UE as distributor and (presumably) Waldheim-Eberle (as copyright owner) – may have applied to the other Mahler publications ‘In die Universal-Edition aufgenommen’. The sale of rights to works by Bruckner and Mahler owned by Waldheim-Eberle to UE was agreed in the summer of 1910, and in most cases this was reflected in entries made in the UE Verlagsbücher later that year. These are unusual in that they record only a delivery date and numbers of copies concerned, and, moreover, the date is the same in every case: 17 November 1910; whether these entries document merely a paper transfer or the physical relocation of the remaining stock is not made clear. The only Mahler Waldheim-Eberle publications that have no such entries are those that had been issued under licence since 1906: the study scores and piano duet arrangements of the first four symphonies and the collective piano and voice volumes of the Wunderhorn songs, stocks of which had been managed by UE for four years; and the last three publications in the 1908 batch. The print orders for the two Wunderhorn volumes listed in the 1908 batch indicate that even before UE had formally acquired sole rights, it had been decided to reissue the collection in two, rather than three volumes (see Des Knaben Wunderhorn PVC2), and a print run of 100 copies, though modest, is not exceptional. If the UE Verlagsbuch is correct, no copies of the vocal score of Das klagende Lied were transferred to UE in November 1910, so perhaps the February 1910 print run of 30 copies followed up with an order for 18 copies on 16 March was needed because the edition was in danger of going out of print. By that year the work had been performed only three times since the 1901 première, but two performances, under Paul Ottenheimer in Prague and Julius von Weis-Ostborn in Graz were scheduled for March 1910: it is just possible that, though rather late in the day, the first order was in some way connected with these events. Early in 1908, at the age of 39, Emil Hertzka replaced Arthur Fadüm as the chief executive of Universal Edition,² an event that was to result in a decisive transformation of the firm's publishing strategy as it increasingly focussed its activity on the publication of new music as was already hinted at in advertisements published at the end of the year. Emil Hertzka was a strange man, a mixture of commercial astuteness and rash idealism....His appearance seemed to contradict his actions: he looked as old-fashioned as any fin-de-siecle artist, with his long hair, long beard, brown velvet jacket and large black tie – a majestic figure, half Wotan and half Brahms, who contrasted strangely with revolutionary music and its vociferous composers and propagandists. Although I worked for quite a few years next door to him I never discovered whether he could even read music, nor did I ever, hear him talk about it with enthusiasm or even sympathy. He was more feared than loved; his thin, sharp voice seemed not to belong to his imposing figure. He was not a kindly or genial man but displayed a biting and often cynical sarcasm (which, incidentally, was apparently his most effective weapon in dealing with Arnold Schoenberg). It was said that Hertzka, for all his costly and unremunerative patronage of new ideals, never lost sight of his own personal interests, and we, his assistants, used to sing an uncomplimentary little song about it to a tune from Tchaikovsky's ‘Pathetique’. [This is reproduced in HHMFS, 51] And still he did what no other music-publisher at that time dared to do, and considerable sums of money were spent not only on engraving, printing, paper, binding and publicity but also on supporting financially the struggling prophets of the new art. All this was done without charm, grace or warm-heartedness, without any evident generosity – and yet it was still a unique undertaking. Was hast du mit Herzka vor! Ich rate dir, lasse dich nicht mit ihm ein. Er ist ein ganz gefährlicher Mensch. Ich wäre froh, wenn ich mich von ihm losmachen könnte. Er verübt einen Schurkenstreich nach dem andern an mir. What's up between you and Hertzka? I advise you not to have anything to do with him. He is a very dangerous man. I would be happy if I could separate myself from him. He perpetrates one trick after another on me. On the other hand Hertzka's relationship with Mahler seems to have been generally cordial, and in 1909–10, as part of his idiosyncratic business plan, he initiated a policy of vigorously acquiring the copyrights to or licences for all of Mahler’s works; by 1911 he had succeeded, with one exception. The fact that the Fifth Symphony initially eluded his grasp may indicate that Peters Edition (rightly) perceived UE as a growing and serious competitor, and that nothing was to be gained by licensing the work. 1. Ich trete das Verlagsrecht ab. 2. Ich erhalte von sämtlichen Einnahmen (Brutto) 50 Prozent. 3. Sie stechen Partitur und zweihändigen Klavierauszug mit Text und autographieren die Orchester­und Chorstimmen. 4. Ich bekomme jährlich einmal an einem bestimmten Tage die Abrechnung und habe zu jeder Zeit das Recht, die Bücher einzusehen. 5. Der Klavierauszug wird sofort gestochen; Partitur und Stimmen unmittelbar nach der ersten (Ur-) Aufführung. 6. Das Recht der Uraufführung behalte ich mir ausdrücklich vor. Bitte, den Vertrag so bald als möglich mir zur Unterschrift zuzusenden, da ich aus bestimmten Gründen mich noch vor Mitte August entscheiden muß. 1. I relinquish the copyright. 2. I receive 50% of all gross earnings. 3. They engrave the score and the vocal score and print the orchestral and chorus parts by lithography from writing. 4. A statement of account will be rendered to me once a year, on a given date, and I have the right to examine the books at any time. 5. The piano reduction is to be engraved at once: score and parts immediately after the first performance (premiere). 6. I expressly reserve to myself rights to the first performance. Please have the contract sent as soon as possible for my signature, as there are certain reasons why I have to make a decision before mid-August. Beiliegend den unterschriebenen Brief. Bezüglich einiger mir sehr wichtiger Details werde ich im Herbst, nach meiner Rückkehr vom Land mit Dir. Hertzka, von dessen Urbanität ich die angenehmsten Beweise habe, persönlich Fühlung nehmen. Dazu gehören vornehmlich zwei Punkte. 1. Die Herstellung einer möglichst billigen, handlichen Partiturausgabe für Studienzwecke. 2. Der Preis für die zweihändigen Klavierauszüge, der im Interesse der Verbreitung meines Werkes und schließlich sogar im finanziellen Interesse des Verlags möglichst billig angesetzt werden möge. Den Gegenvertrag bitte ich mir vorläufig nach Toblach zuzustellen, da ich meiner Frau (die, wie Du weißt, jetzt nicht hier ist) gerne Einblick in den­selben verschaffen möchte. Mein Programm hat sich unterdessen dahin modifiziert, daß ich mir Deine Ankunft hier schon für den 2. oder wenigstens 3. Juli erwünsche, warum dies, habe ich hoffentlich bald Gelegenheit, Dir mündlich mitzuteilen. Bitte, grüße Direktor Hertzka herzlichst von mir. 1. The production of an edition of the score for purposes of study, as cheap as possible and in convenient format. 2. The price of the vocal score, which should be kept as low as possible in the interests of diffusion of my work and indeed also in the financial interest of the publisher. Please in the meantime have my copy of the contract sent to Toblach, as I should like to let my wife (who, as you know, is not here with me at the moment) have a look at it. My timetable has meanwhile changed in such a way that I should like you to arrive here on 2 or at least 3 July. I hope to have a chance soon to tell you in person why this is. Please give my kindest regards to Direktor Hertzka. Sie verpflichten sich, die Partitur und den zweihändigen Klavierauszug mit Text zu stechen und die Orchester- und Chorstimmen zu lithographieren. Sie haben sich verpflichtet, den Klavierauszug mit Text bis zum 1. September 1910* fertigzustellen, widrigens Sie mir eine im voraus vereinbarte Konventionalstrafe von 1000 Kronen zu bezahlen haben, wobei mir weitere Schadenersatzansprüche für den Fall schuldhafter Verzögerung vorbehalten bleiben. Ebenso sind Sie verpflichtet, den Stich der Partitur gleich in Angriff zu nehmen und bis zur Herstellung der ersten Korrektur zu fördern. Die weitere Ausführung und schließliche Fertigstellung der Partitur wird zugleich mit Herstellung des gesamten Stimmenmaterials ohne Verzug nach der Uraufführung vorgenommen. Ferner haben Sie ein vollständiges Material der Orchester- und Gesangsstimmen in Abschrift resp. hektographisch herzustellen, welches für die Uraufführung benützt werden soll. Da mir das Aufführungsrecht überhaupt vorbehalten bleibt, so habe ich auch über die Uraufführung zu verfügen. You engage yourself to engrave the score and the piano reduction (two hands), with text, and to lithograph the orchestral and choral parts. You have undertaken to complete the piano score with text by 1 September 1910* failing which you have to pay me an agreed penalty of 1,000 crowns, which nevertheless does not prejudice my right to further damages in case of culpable delay on your part. In addition you have contracted to begin the engraving of the score at once and to press on with it up to the first proof stage. The further execution and final revision of the score will be undertaken, simultaneously with the production of the complete parts, without delay immediately after the first performance. Moreover you are to produce a complete set of orchestral and vocal parts, either in copy or mimeographically, which will be used for the first performance. Since the right of performance in all cases is reserved to me, I therefore have full control over the first performance. * For reasons that will become apparent, it seems possible that this year is a slip for 1909. The urgency stemmed from the fact that Mahler was already having discussions with the impressario Emil Gutmann – who had been instrumental in arranging performances of the Sixth and Seventh Symphonies – that were presumably the preliminary planning for the première of the Symphony in September 1910. On 26 June Mahler could report to Alma ‘Gutmann kündigt auch seinen Besuch für August an in Sachen Musikfest’ [‘Gutmann has announced his arrival in August to discuss the Music Festival’]. (GMBaA, 394; GMBaAE, 331). Mahler understood that J.V. 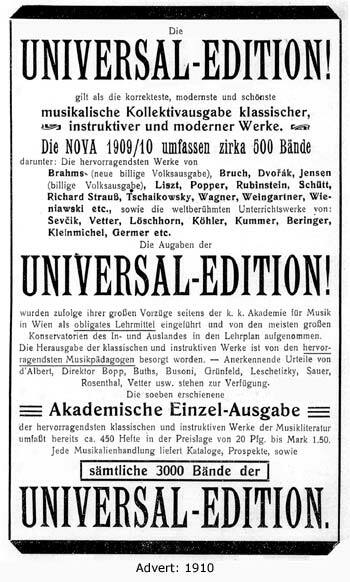 von Wöss, by this time the in-house music editor of Universal Edition, was going to prepare the vocal score over the summer (see GMB, 259–60; GMSL, 344) so that it would be completed by 1 September 1909 (see above), but by 24 September 1909 it was still not finished, and Mahler doubted that the vocal score and chorus parts could be ready by 2 January 1910, the deadline he was insisting on to ensure that the choirs had sufficient time to learn the work (see Mahler to Gutmann, GMUBE, 72). Despite Hertzka's assurances (see GMUB, 73; GMUBE, 72) the vocal material was not ready until rather later (see Table 3 below), but Mahler was very impressed with the quality of the work (KBME, 261, 263) and thanks to Gutmann's persistence, the première took place as planned on 12 September 1910. The printed string parts were prepared in time for the first orchestral rehearsals and the full score was issued early in 1911 (though the study score was not published until 1912). While UE was grappling with the huge task of publishing the Eighth Symphony, it was licensing works from C.F. Kahnt and taking over the rights to other works from Eberle. The initial batch of Kant editions ‘In die Universal-Edition aufgenommen’ were assigned edition numbers within a single block (the voice and piano versions of Um Mitternacht for some reason did not make it into that continuous sequence). A further group of numbers were assigned in 1912 (as part of a larger ‘Mahler’ sequence) to full scores of the songs but the unusual and fragmentary entries (mostly made some time after the edition numbers were assigned) suggest that it is unlikely that any copies were ever issued by UE. In the case of the publications that were issued, it is not clear where the main printing was undertaken; it is likely that the sheets were imported from Germany and that only the covers were produced in Vienna. The exact nature of the licence with Kahnt is unknown: presumably UE had distribution rights within Austro-Hungary and perhaps in a limited number of other territories. Certainly it appears that the complete set of full scores of the Lieder supplied to the British Library in 1923 by J. Curwen & Sons, Ltd came via UE, as that firm's edition numbers have been added to the front wrappers in pencil. Mit Vorliegendem bestätige ich Ihnen, daß ich gegen die Übergabe meiner bei der Firma Druckerei & Verlagsaktiengesellschaft vorm. R. v. Waldheim, Jos. Eberle & Co, Wien, erschienenen Werke in das Verlagseigentum der Universal-Edition nach keiner Richtung hin etwas einzuwenden habe, selbstverständlich unter der Voraussetzung, daß alle meine erworbenen Rechte mir gewahrt bleiben. I hereby confirm to you that I have no objection of any kind to the transfer to Universal Edition of the publishing rights in those of my works which have appeared under the imprint of Druckerei & Verlagsaktiengesellschaft vorm. R. v. Waldheim, Jos. Eberle & Co., Vienna, naturally on condition that I retain all my acquired rights. As can be seen from Table 5, the initial Verlagsbuch entries for all of these publications are exceptional in a number of respects: none of the the initial entries include the print order date or quantity; the date of receipt in every case is the same – 17 November 1910; and the quantities are in some cases very unusual (e.g. 39 or 222). In the absence of any other information, the best working hypothesis seems to be that these entries record the delivery of the remaining stock of these publications from the original publishers, and that this stock was retailed by UE until it was exhausted and new UE printings ordered. If this is correct – and the relevant catalogue entries assume that it is – it offers an explanation (and date) for the copies of the Weinberger or Doblinger publications listed in table 5 that survive with ‘Universal-Edition’ labels pasted over the original publisher’s imprint: these published formats were never ‘In die Universal Edition aufgenommen’ (though other formats had been from 1906), but were now owned by UE. It was probably if and when UE reprinted the publications (whether previously in the UE catalogue, or not), that it substituted its own plate numbers for those originally assigned in the EWZG sequence. The fact that the Verlagsbuch also contains identical entries for 17 November 1910 relating to the large number of works of Bruckner that were transferred to UE from other publishers (in part due to Mahler, see below) tends to reinforce this interpretation of the Mahler entries. Vergiß nicht bei der vorzunehmenden Abmachung mit der U.-Edition, daß dieser äußerst unbequeme, vor allem schmähliche Passus, daß ich immer erst anfragen muß, wenn ich etwas gemacht habe, fallen muß. Es ist ja wahrscheinlich nur akademischer Natur, denn ich gedenke von der U.-E. nicht mehr wegzugehen. Aber trotzdem stört mich die Sache, so oft ich daran mich erinnere. Regarding the contract about to be made with U-Edition, don’t forget that this extremely tiresome but, above all, disgraceful clause, which stipulates that I must always give them an option when I have finished anything, must be dropped. It is probably only an academic point, for I do not intend ever to leave U.E. But even so, it irritates me every time I think of it. Eben erhalte ich Deinen Brief. Die Sache mit der Edition hatte seine Richtigkeit. Jedoch muß der Passus („Retouchen") präziser gefaßt werden. Die Edition muß sich verpflichten, 1. alle Änderungen in sämtlichen Platten (Partitur und Orchesterstimmen) vorzunehmen; 2. so lange sie die vorhandenen Materialien zum Verkauf bringt, muß sie sich verpflichten (aber auf ihre Kosten – und nicht so, daß ich für dieselben zur Hälfte aufzukommen hätte), die von mir vorgeschriebenen Änderungen in den betreffenden Partituren, respektive Orchesterstimmen eintragen zu lassen. (Daß dies mit schwarzer und nicht mit roter Tinte geschehen soll, bitte ich privatim dem Direktor Hertzka zu sagen, falls ich es vergessen sollte, denn es ist mir bis jetzt beinahe jedesmal passiert, daß der Schafskopf von Kopisten sich bemüßigt sah, auch meinem Beispiele in der Vorlage zu folgen, so, daß die Orchestermusiker am Abend nicht daraus spielen konnten, weil man beim Lampenlicht rote Tinte nicht lesen kann.) 3. mit den Gesangskompositionen bleibt es, wie bisher. Von diesen bekomme ich sofort die Hälfte der Einnahmen ohne irgendwelchen Abzug. Unter diesen Bedingungen erkläre ich mich einverstanden, daß die Edition die Kosten für die vier ersten bei ihr erschienenen Symphonien mit 50.000 Kronen berechnet und für diese zusammen ein Konto führt, das heißt ohne für die einzelnen separat zu notieren. So lautet meine Abmachung mit Direktor Hertzka. Bitte, also ganz präzis und klar diese Punkte schriftlich zur Unterzeichnung vorzulegen. I have just received your letter. The [Universal] Edition matter was right enough. However, the clause (‘revisions’) must be formulated more precisely. The Edition must agree 1. to make any changes on all plates (score and orchestral parts); 2. to enter any changes I require in the relevant scores or orchestra parts for as long as they offer the material for sale (but at their expense – not passing on half of their costs to me). (Please tell Direktor Hertzka, privatim, in case I should forget, that this is to be done in black, not in red, ink, for it has happened almost every time that the blockhead of a copyist has felt obliged to follow my example in the original, with the result that the orchestra could not play from it in the evening because red ink can’t be read by lamplight.) 3. that the vocal compositions are to be treated as hitherto. I am to receive half of the earnings from these without any deductions whatsoever. On these conditions I am prepared to accept Edition’s estimate of the cost of the first four symphonies they have published as 50,000 crowns and agree that Edition should keep one account (for) all of them, that is, without keeping a separate account for each symphony. This is what was agreed between myself and Direktor Hertzka. Please see that these points are stated precisely and clearly, so that the agreement can be signed. Als ich im Sommer nach Toblach gekommen war, berichtete mir Mahler, dass Direktor Hertzka von der Universal Edition da gewesen sei; er habe die ersten Symphonien Mahlers aus dem Verlag Waldheim & Eberle übernommen und diese vier Symphonien, die mit der Gestehungssumme von 50.000 Kronen (10.000 Dollar) gebucht waren, seien nun fast aktiv gewesen, es fehlte nur noch die Summe von 2500 Kronen. Nun aber wollte die Universal Edition auch die Werke Bruckners übernehmen und grosszügige Propaganda dafür machen. Dies könne aber nur geschehen, wenn Mahler seine Symphonien aufs neue mit 50.000 Kronen belasten liesse. Mahler fand das gut und richtig. Er übernahm das neue Passivum aus Liebe zu Bruckner, ohne einen Moment darüber nachzudenken, dass er sich dadurch auf weitere 15 Jahre um Jeden Gewinn geschädigt hatte. Es ist „selbstverständlich", dass Mahler aus dem Gewinn bei den Werken Bruckners nie einen Kreuzer bekam, – und auch nie erwartet hat. When I returned to Toblach that summer after leaving the sanatorium, Mahler told me that Hertzka of Universal Edition had been to see him. He had taken over Mahler’s first four symphonies from Waldheim & Eberle. The terms of publication were that the symphonies were to earn 50,000 crowns (10,000 dollars) before yielding Mahler any royalty. They were within 2,500 crowns of doing so, and Mahler was therefore just about to profit from them. 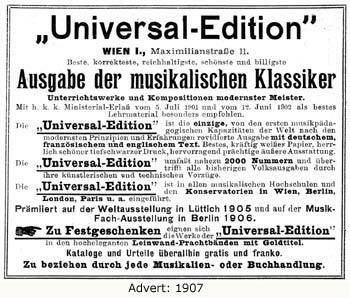 Having made this clear, Hertzka went on to ask Mahler to forgo his profits until a second sum of 50,000 crowns had been earned, on the grounds that Universal Edition would like to take over the works of Bruckner also, and advertise them at great expense. Mahler agreed at once. He thought it only right that he should sacrifice his profits for another fifteen years out of love of Bruckner, without of course receiving, or expecting, a penny from the sale of Bruckner’s works. The ‘terms of publication’ must refer to the original contractual arrangement between Mahler and EWZG, though Mahler was perhaps being pessimistic: the symphonies had first started to appear a mere ten years earlier, so he might not have needed to wait fifteen years for them to earn him his first royalty cheque. The reference to ‘Retouchen’ in Mahler’s letter to Freund may reflect a plan for new editions of all four of the early symphonies. In the middle of July Mahler acknowledged receipt of the score of his Second Symphony for the insertion of retouchings (and again made the point about such changes being made in black ink in the parts), but asked that for the moment he should be sent no more work of this type, as he other things to do (not least the composition of the Tenth Symphony, which he did not admit to Hertzka) (letter received at UE on 18 July 1910, see HLGIV, 832). 1. Mit der nun definitiv festgestellten Partitur in Übereinstimmung zu bringen. 2. (nach „innerhalb sechs Monaten"), die der vierten Symphonie nach erfolgter Aufführung unter meiner Leitung in der dann endgültig festgestellten Version. – Dies ist aus sich selbstverständlich. 1. to make agree with the now finally established score. 2. (after `within six months’), those made in the final version of the Fourth Symphony as established after performance under my direction.–This is self-evident. If I am not mistaken, the sales clause is made irrelevant by the omission of the penalty for non-fulfilment of contract. – If so, I find the contract quite acceptable. – If not, please let me know. The contract was finally signed on 11 August 1910 (FWGMV, pp. 224-225). Apart from the impact on the publication of Mahler’s own music, the effect on the dissemination of Bruckner’s music was also prompt: UE edition numbers 2878–2928 were all assigned to a large variety of works by Bruckner and copies delivered (presumably unsold stock) on 17 November 1910, or printing ordered between then and April 1911. The relationship between Mahler and Hertzka extended beyond issues concerned with the publication of Mahler’s music, and it was through UE that in the summer of 1910 Mahler acquired scores of a wide range of works, some of which he clearly wished to consider for his concert programmes (HLGIV, 831ff.). On the other hand, Hertzka was no doubt anxious that the enormous success of the Eighth should be followed up with premières of his two most recently completed compositions and seems to have hinted in a letter that a first performance might be given in Vienna in Mahler’s absence. Decisions over this matter were very clearly identified in the contract as being in Mahler’s hands alone, and he didn’t hesitate to point this out very firmly in a letter to Hertzka on 29 December 1910 (FWGMV, 233–4). The matter was smoothed over rapidly, and in his last surviving letter, written to Hertzka on 21 February 1911, Mahler was discussing items recently published by Universal Edition that might have been included in a concert of Czech music – Suk and Nowak – and the fact that he had made numerous revisions to the Fourth Symphony in connection with the recent performance he had conducted (FWGMV, 236–7). This advert is particularly useful because it includes prices in Kronen. (22 March 1914), p. 154ff.